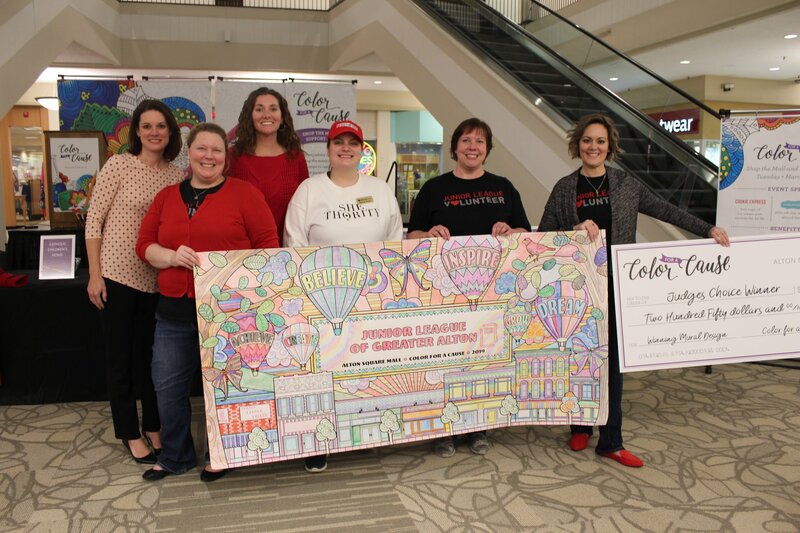 The Junior League of Greater Alton was awarded $250 toward the Junior League Locker for winning Judges’ Choice in the Color for a Cause mural coloring contest Tuesday, March 12, 2019 at Alton Square Mall. Photo courtesy of Alton Square Mall‘s Facebook page. A big thank you to everyone who came out to color and/or support us and the other non-profits that participated! 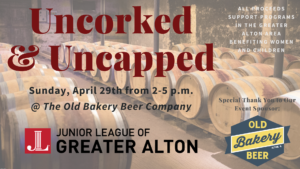 ALTON – Junior League of Greater Alton will participate in this year’s Color for a Cause, a live mural coloring contest and shopping event that raises funds and awareness for local causes, from 5-7 p.m., March 12, at Alton Square Mall. During the event, JLGA and other participating organizations will be provided a 6-foot mural and coloring supplies. Everyone has two hours to color their mural and shop on behalf of a cause. Patrons can shop anywhere in the mall and show their receipt in center court to earn a point for a participating cause. The mall will donate $1 for each point earned and a $250 prize donation will be awarded to the organization with the most points and winning mural design, as determined by local guest judges. Alton Square Mall has announced the organizations participating in Color for a Cause. In addition to Junior League of Greater Alton, they are: Community Hope Center, Inc., Good Samaritan House – Shelter of Granite City, IMPACT CIL, Make-A-Wish Southern Illinois, Olga’s Kitchen in support of Boys and Girls Club – Alton Chapter, Ronald McDonald House Charities of St. Louis, Senior Services Plus, Inc. to benefit Feed the Need and TreeHouse Wildlife Center. The Junior League of Greater Alton has installed its new board for the 2018-2019 year and has begun recruiting members for its 2018 Provisional Class. Leading the board this year is President Laura Inlow, who replaced 2017-18 President Lauri Sholar. Inlow joined the league in 2015 and has served as the organization’s secretary and vice president. She works at Lewis and Clark Community College as manager of the Media Services Department, which handles the college’s marketing, advertising and public relations efforts. She and her husband, David, have one daughter, Amelia. 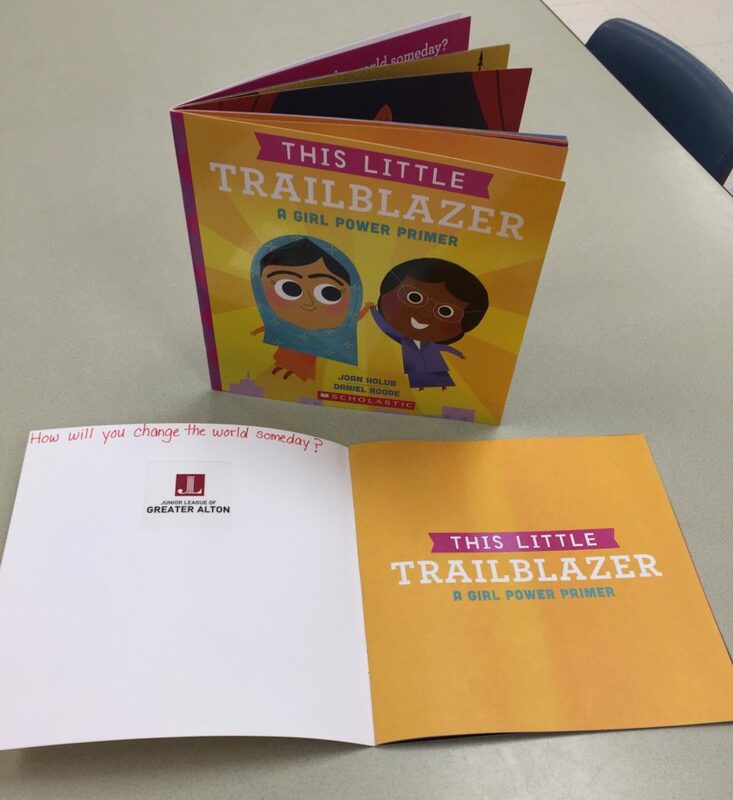 Other members of the 2018-2019 board include Vice President Nicole Fiedler, Secretary Jama Fabry, Treasurer Sarah Crause, Project Council Coordinator Jolene Sherman, Fund Development Coordinator Lisa Crause, and Sponsorship Coordinator Maggie Partipilo. There are 32 active and 24 sustaining members of JLGA, a member organization of the Association of Junior Leagues International Inc.
JLGA is committed to educating, training and empowering female leaders through volunteerism in the Riverbend community, and has partnered with such organizations as the Boys and Girls Club of Alton, Oasis Women’s Center, Bucket Brigade, Main Street Methodist Church, Riverbender Community Center, Riverbend Head Start, First Presbyterian Church, and Community Hope Center, among others. Women interested in joining JLGA are invited to attend a social event from 6-8 p.m. Thursday, July 26, at State Street Market. Visitors will have an opportunity to hear about the organization and mingle with current members. For more information about the JLGA Annual Social, contact Amber Haring. ALTON – Diana Kay loves her little house in the 3600 block of Horn Avenue in Alton – and especially so after Saturday’s annual Bucket Brigade event. It’s the 30th year of the original Bucket Brigade effort, founded by then-Pride Inc. President Dale Neudecker. Since then, the teams have gathered each May to paint nearly 1,500 homes. Kay, herself, had a hand in more than a few of those. She’d painted in Alton Bucket Brigades herself since high school. Her father led a Boy Scout troop that did the same. “It was neat to be on that side of it, and do it for people who couldn’t do it themselves,” the career healthcare provider, with expertise in hospice work, said. But even with her seemingly unbreakably bubbly spirit, her sentences stifle when describing what it means to be a Bucket Brigade recipient. Kay’s home, which she cheekily proclaimed the nicest on her street, was polished and painted by a team from the Junior League of Greater Alton, a loyal member of the Bucket Brigade. 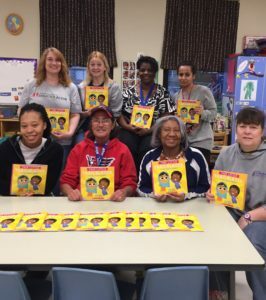 JLGA recently purchased books about important women in history who broke through racial, social and economic barriers for Riverbend Head Start & Family Services in honor of Women’s History Month. Shown here are members of the teaching staff at Granite City South with our donation. For more information, contact 2017-2018 Community Outreach Chair Rhonda Brinkman at rbrink70@yahoo.com.